"I have been to Palestine where I've witnessed the racially segregated housing and the humiliation of Palestinians at military roadblocks. I can't help but remember the conditions we experienced in South Africa under apartheid. We could not have achieved our freedom without the help of people around the world using the nonviolent means of boycotts and divestment to compel governments and institutions to withdraw their support for the apartheid regime. Omar Barghouti's lucid and morally compelling book is perfectly timed to make a major contribution to this urgently needed global campaign for justice, freedom and peace." THIRTY YEARS ago, an international movement utilizing boycott, divestment, and sanction (BDS) tactics rose in solidarity with those suffering under the brutal apartheid regime of South Africa. The historic acts of BDS activists from around the world isolated South Africa as a pariah state and heralded the end of apartheid. Now, as awareness of the apartheid nature of the State of Israel continues to grow, Omar Barghouti, founding member of the Palestinian Civil Society Boycott, Divestment and Sanctions (BDS) campaign against Israel, presents a renewed call to action. Aimed at forcing the State of Israel to uphold international law and universal human rights for the Palestinian people, here is a manifesto for change. 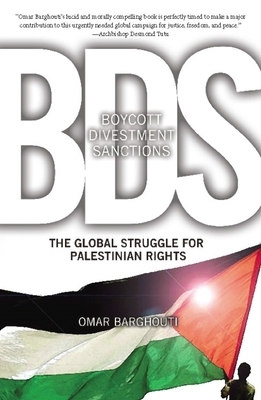 "No one has done more to build the intellectual, legal and moral case for BDS than Omar Barghouti. The global Palestinian solidarity movement has been transformed and is on the cusp of major new breakthroughs." "There is no more comprehensive and persuasive case than his for boycott, divestment, and sanctions to end the Israeli occupation and establish the ethical claim of Palestinian rights." Omar Barghouti is an independent Palestinian commentator and human rights activist. He is a founding member of the Palestinian Campaign for the Academic and Cultural Boycott of Israel (PACBI) and the Palestinian Civil Society Boycott, Divestment and Sanctions (BDS) campaign against Israel. He holds a bachelor's and master's degrees in electrical engineering from Columbia University, NY, and a master's degree in philosophy (ethics) from Tel Aviv University.